At EverLine we have high quality epoxy flooring products and cutting edge equipment to deliver superior epoxy flooring solutions. Large or small surfaces, it doesn’t matter we can help. If you want to protect the concrete floors in your Toronto property, epoxy floor coatings from the experts at EverLine Coatings and Services are a great solution. Our epoxy concrete floor coatings come with numerous benefits. For example, it makes your flooring easier to clean and can make a great non-slip surface in high traffic areas. It does all of this while protecting the concrete floors in your business to ensure that they have a longer lifespan. EverLine can provide Toronto epoxy flooring services to properties with concrete floors of any size, shape and we can even customize the colour of the coatings with epoxy paint. If you’re looking for a unique epoxy floor coating in Toronto to protect your floors and make them look amazing, EverLine Coatings and Services can help. Epoxy floor coatings create a non-slip surface. Epoxy flooring is easy to clean. Epoxy flooring is chemically resistant in the event of a spill. Applying an epoxy sealer protects your concrete and can extend its lifespan. Epoxy is the most affordable flooring solution compared to any other alternative. The coatings are customizable for each application. We can use any colour of epoxy paint and create any design you would like. EverLine is continually working to improve its operations to provide clients with the most value possible and deliver expectation shattering results. A big part of our ability to deliver comes from our unique CORE quality system. We strive to be completely transparent with our clients and ensure that we are meeting your expectations with every step of our Toronto epoxy flooring projects. At EverLine Coatings and Services, we have three key values that set us apart from our competitors. These key values are; continually innovate, systemize quality for great results, and to always answer the call when our clients need us. Because we are wholly committed to these key values, we can offer Toronto epoxy flooring solutions that cannot be matched by our competitors. We are committed to delivering each EverLine Coatings and Services client with the highest quality of work, flexibility to provide our services when it is convenient for the client, and we promise to always be there when you need us. It is this commitment to serving our customers to the best of our ability that makes us the industry leader in Toronto epoxy flooring solutions. At EverLine, we strive to continually innovate our Toronto epoxy flooring services so we can better serve our clients. We strongly believe that innovating to provide better services is the key to success in the Toronto epoxy flooring industry. Manufacturers are continually innovating the epoxy sealers and flooring products that they offer, because of this, we continuously innovate our application methods and update our equipment to stay current with industry trends. Because we are always on the cutting edge when it comes to Toronto epoxy flooring solutions, we are considered the epoxy flooring experts. We are committed to training our Toronto epoxy flooring crews regularly. This ensures that they are highly trained with the latest epoxy concrete floor application techniques so they can deliver the best quality services possible to our clients. 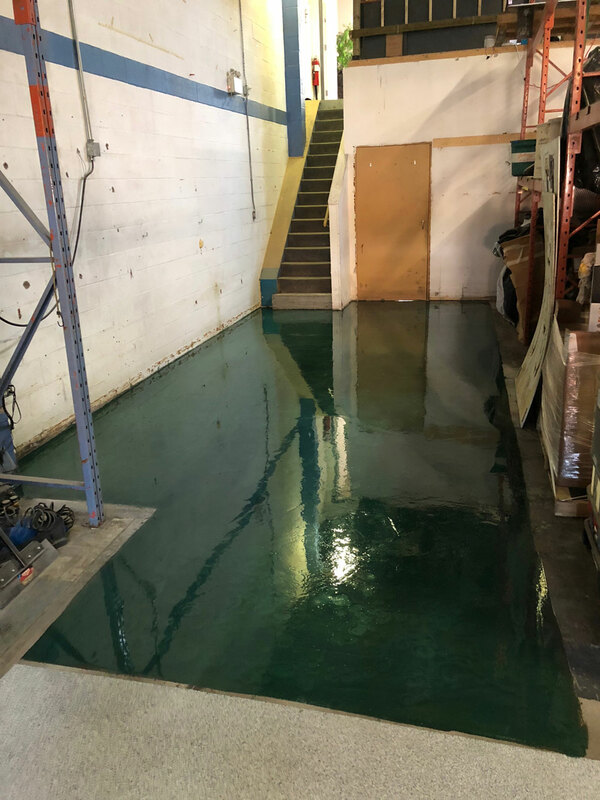 We do not let the members of our epoxy flooring crews complete work for our clients until they have been through our rigorous training problems and they have proven that they can deliver quality results. You can trust that the EverLine Coatings and Services crews are the Toronto epoxy floor coating experts. Our expert crews will give you peace of mind knowing that they can deliver a perfect epoxy floor coating application every time. If you will be receiving epoxy floor coating services from the crews at EverLine soon, there are a few things you can do to prepare. To ensure a proper application and that your epoxy floor coating will have good longevity, please ensure that the concrete floor to be epoxied has been cleaned and is free of any debris. A clean concrete floor will help the epoxy sealer create a good bond for a flawless finish that will last a long time. In addition to cleaning, please put up signs and notices that our crews will be applying an epoxy concrete floor coating. This will ensure that no one will walk through the wet epoxy floor coating ensure that the work that has been completed will not be ruined. At EverLine Coatings and Services, we work to provide the best value that we possibly can to our clients. That being said, there are no two identical Toronto epoxy flooring projects. Because of this, we do not offer set epoxy flooring packages as we believe this would not deliver the best value to our clients. There are a number of different factors that affect the cost of epoxy flooring solutions. Things like the size of the surface, the type of epoxy being used, if we will be using an epoxy paint to create a design, and any other complexities that could take the project longer to complete. To deliver the most value possible to our clients, we evaluate all of the details pertaining to your epoxy flooring project and determine the price of each project on a per job basis. If you would like to receive a free quote for your next epoxy flooring project, please contact us.